Judul Umpan Klik (Clickbait), yakni judul tulisan atau berita yang bermaksud agar diklik, merupakan jalan pintas mendapatkan pengunjung. Namun, judu-judul sensasional yang cenderung menipu pembaca ini, hanya akan menurunkan kredibilitas dan lambat-laut ditinggalkan pengunjung. OH, it’s the clickbait headline. We barely knew you before people started ignoring you, and it’s time for you to leave for good. But why? What is wrong with using clickbait headline? Well, it sounded like a good idea at first. But the Internet is a place of excitement, where new things tend to take off, so a good way of getting clicks was to make titles more exciting. Except… a lot of companies failed to take growing user cynicism into account. Let’s be honest here. A lot of companies go overboard when there’s a new ‘trick’ for internet marketing. Many of them are concerned that if they don’t jump on the bandwagon fast enough, one of their competitors will jump past them and cut into a majority of their sales. However, users tend to recognize these tactics, though. That’s because companies push them so hard that people can’t avoid seeing the same thing over and over and over again. The average clickbait headline is like a person in a crowd jumping up and screaming, demanding to be heard. If there’s just one person doing that, then everyone’s going to pay attention to them. However, most clickbait headlines only appear around other clickbait headlines. 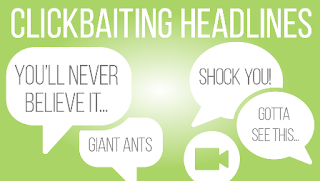 Whether it’s organic search results, posts in social media, or anywhere else they appear, clickbait tends to be grouped with other clickbait. Therefore, it quickly becomes an entire group of people all waving for the user’s attention. Is it any surprise that most people’s reaction is to reflexively ignore the crowd, in the same way they’ve learned to ignore intrusive banner ads? This problem has magnified when clickbait starts to intrude into other areas. For example, around the end of 2015, social media site Tumblr was flooded with clickbait posts that were tagged with things completely unrelated to their content. As every good inbound marketer knows, inbound marketing is most successful when it finds people who are already interested in a subject, and not those who are deliberately and intentionally searching for something else. If someone is looking for posts from their favorite television show, they aren’t going to be interested in clickbait headlines. Worse, if the clickbait is pushed so heavily it crowds out everything else, which is what actually happened on Tumblr, where many searches returned nothing but clickbait until the administrators got it under control, people aren’t going to click. They’re going to leave, and they’re going to be very upset at whoever was intruding into their life that way. Sensationalism is not a viable long-term strategy. If it’s only done every now and then, and not mixed in too much with other sensational material, then it might work. It’s a lot of time and money being spent on something users are learning to ignore, which is why sensationalism is the first big problem with this sort of headline. Try This Instead: Ditch the sensationalism. Instead of trying to act like your content is the most amazing thing ever, tone it down and sound like a serious, professional company instead. As part of its sensational nature, clickbait tends to promise an amazing story to anyone who clicks on it only to deliver content that’s mediocre at best. The article itself is rarely able to live up to the hype of the headline, and in many cases, provides no useful information to the person clicking on it. Lines like “You Won’t Believe What This Girl Did!” tend to be high on hype, but low on actual details. Who is this girl? Why should we believe it? Essentially, clickbait headlines ask visitors to trust them, then they betray that trust as soon as the link is clicked. That’s not how you establish a positive reputation for a brand. In fact, more likely than not, users are going to develop a negative opinion of your company as a direct result. They don’t even need to click the links anymore. Just seeing a clickbait headline is often enough to convince them to distrust wherever it links to. People don’t enjoy having their trust betrayed. It’s as simple as that. Try This Instead: Be honest with your headlines, and tell visitors exactly what they can expect from the content. For example, our own headline “Why Clickbait Headline Is Bad For Your Website” has a little bit of energy to it, but we were also careful to be clear about the content. Clickbait headlines are old news now, and we’re busy telling you why. Even when clickbait headlines succeed at getting visitors to a site, it’s not necessarily going to help the company profit. When users find themselves unhappy with the content of the site, which is a very common reaction to clickbait, the first thing they’re going to do is leave. This gives the page an extremely high bounce rate, and even those that do remain probably aren’t going to be interested in clicking on products, much less advertisements. Companies should not be advertising with the intent of getting more pageviews. The concept of the sales funnel is that customers should be brought through the entire thing, not to bring them onto one page of the site and then abandon them. As a marketing tactic, clickbait is inherently self-defeating. Try This Instead: Treat your headlines as the first step in getting visitors to move through your site. Don’t give them all the information they want on the first page they visit, but give them enough to make them feel like the visit was genuinely worth their time, and that continuing to browse your site will give even more value to them. Any visitor with even the slightest amount of sense would realize that this headline was probably about somebody’s hobby. Perhaps they spend their time building model railroads or decorated the room in an interesting way. Either way, it’s a lot of hype with no particular reason to click on it. Aside from the fact that most people don’t rent videos anymore, which instantly makes this headline a dated reference, and, therefore, irrelevant to the majority of the people reading it. Also, it’s a little confusing. The key problem with this headline is its mix of emotions (sadness and fear), and its goal of encouraging people to find out how these are reconciled. Good headlines focus on one core idea and avoid conflicting terms. Except that politely turning all but one down isn’t shocking to anyone, right? Clickbait headlines tend to love lists, often to the point that people assume any headline starting with a number is potentially clickbait. The biggest problem with this headline, though, is that it gives absolutely no reason for the readers to click on it. Sure, maybe his reaction was shocking, but there’s nothing that makes it relevant to the reader. The best headlines suggest some sort of value (entertainment or otherwise) for the person clicking them. “[Blank] hates him” is a classic clickbait format, suggesting that some (conveniently unnamed) person figured out the secret to easily accomplishing something. On the other hand, ‘hate’ is a fairly negative term for a headline to have, and it’s certainly not going to bring people to the site with the expectation of making a purchase. This format promises something that sounds too good to be true, and it usually is. This type of headline suggests a dark story that’s only now being brought to light, much like the sort of story you’d see on daytime television talk shows. This is another case where the actual story tends to fail to live up to the hype of the headline. Conditions like Dissociative Identity Disorder affect quite literally millions of people each day, usually as the result of an abusive childhood. Headlines that emphasize disorders associated real problems with being quickly ignored, and that’s a genuine negative for society. Today’s internet users care about the social aspect of things and headlines that could harm others are despised even more than most. This sounds like nothing more than a tourism article designed to get people to visit a certain area. And once again, most users will see straight through it. It also has far too many words in it. While the length isn’t too bad, good headlines should be concise and to-the-point. Fourteen words are far too long, especially in an era where mobile users (who have even shorter attention spans than desktop users) are an increasingly important part of the market. Now that you already know what is wrong with the clickbait headline, you should avoid using it. It’s undeniable that clickbait title always lures people in entering your site. However, how long will it be until the visitors realize that your content is no longer useful to them? Once they realized, they will leave your site and will no longer pay attention to whatever you posted. With this, you will probably lose your visitors forever. Imagine the horror! So make sure to write a good headline that is straight to the point and relevant to your visitors. Don’t make them click your headline and then end up in disappointment. Always remember to keep your visitors happy. What are your thoughts about clickbait headlines? Have you ever used a clickbait title before, and what were the results?